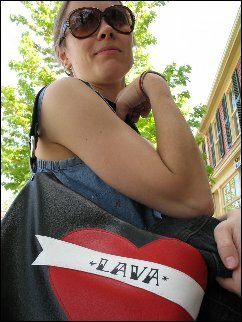 I interviewed Kelly Twomey, who created Veganslovelava.ca which promotes the idea of vegan lifestyle and fashion. She sells a variety of vegan and leather alternative fashions and accessories she receives worldwide. My article "A Sudden Interest in Leather Alternatives" appeared in the October issue of SDM. This month I'm following up with some Q&A's (my Q's and Kelly's A's). Why vegan instead of leather? What made your own personal experience/opinion change, to use leather-free goods? I was about 14 or 15 and I was at a science exhibit based on prehistoric life. The exhibit contained a bunch of different kinds of stuffed animals, and I don't even know if they were real or not, but looking at these animals I started thinking about why anyone would want to kill and stuff an animal to put it on display. I was already vegetarian, or slowly going vegetarian, but that's when the switch happened and vegetarianism became more of a lifestyle choice than a dietary choice. I was wearing a watch that contained a leather-like band (looking back I don't even think it was leather) and I ripped it off and threw it in the garbage right there and then! From that moment on, I became a more conscious consumer. It took me about 10 years to become completely vegan, but leather was the first thing to go. Not yet, but we've got a lot of ideas. The first priority with LAVA [Leather Alternatives & Vegan Accessories] was to quickly get some great alternatives to leather into the Canadian market. Personally, I was getting so frustrated with having to go to cheap stores to buy leather-free shoes and belts, and those would fall apart after a couple of months (or even weeks) of wear. Not to mention, there is almost nothing available if you want something stylish. I felt that there were very few cruelty-free options for Canadians, and I knew of so many amazing companies that are already making great products that are not easily accessible to Canadians. So my first goal was to bring in some quality and ethically made merchandise, and in the future we will definitely look into making our own fun animal-friendly gear. What is the history of your website? We're pretty new to the Canadian vegan scene actually. 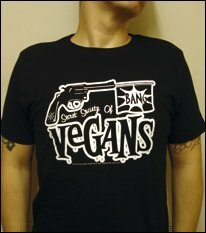 I went vegan in 2002, and then shortly after I moved to the Netherlands. I started thinking a lot about bringing LAVA to life while I was still in Holland, but I knew that I wanted to do it in Canada. Chris and I moved back to Canada in the summer of 2007 and I took the whole summer off to plan. In the fall it really started to come to life, the website was up and running, and we started posting recipes and a survey to find out what kinds of things people are looking for. We also started circulating our newsletter "LAVAlicious" that discusses vegan and environmental issues. Our virtual doors officially opened in January 2008. Chris and I are both still working full time, but we're slowly adding more products and trying to make the website better and more interactive. Eventually we hope to have a beautiful website community with postings and forums and a little online listener cafe profiling vegan/vegetarian musicians. We're not quite there, but we're working on it! When did you start, why, what features do you offer, where do you get products, and how much are they? I started officially in January 2008, but LAVA was a thought that began sprouting and growing in the spring of 2007. We decided it was time that Canadians who refuse to use animal skins for fashion have a place that they can go where they can browse cruelty-free fashion accessories such as shoes, belts, bags, etc. Additionally we want to offer the kind of products that make living as a vegan fun, healthy, and happy, such as buttons, slogan t-shirts, aprons, and a variety of books (cookbooks and otherwise). We also want to offer an online spot where people can learn about the alternatives and vegan culture as a whole (incorporating food, clothing, music, books, art, etc.). Eventually we'll have a place where people can come and discuss those things openly with other like-minded people. We currently offer a few different features on the website: a weekly vegan recipe, a monthly veg artist spotlight, a newsletter that covers a variety of animal and earth-friendly topics (it comes out about once every 2 months), and a survey where people can tell us a bit more about themselves. We also offer links to various outside websites, such as social networking websites and other websites where people can get more information on being vegan/vegetarian or animal-friendly ethical fashion. As for prices, we have everything from buttons and stickers for $1-$2 to very beautiful high quality vegan footwear that sells for $100-$250, and everything in between. I am interested in footwear and bags. Where are yours from? Our footwear collection is expanding all the time, and right now we offer an assortment of Vegetarian Shoes. 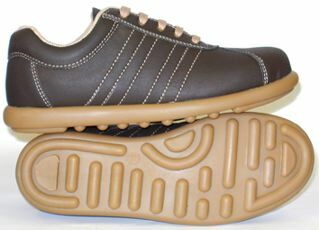 Vegetarian Shoes is a UK based company, and their shoes are all manufactured in the UK and in Europe. The bags we currently offer come from a wonderful New York based business called Dungaree Dolly. Their bags are all hand made and can be customized to suit each individual's style. We are constantly expanding our selection of products and so you should check back often for new products and manufacturers. Is there much of a price difference? No. The cost of leather and the cost of quality animal-friendly alternatives is comparable. If you're interested in sustainable, ethically produced fashion, then you will pay more than you would at your average discount store. That's simply because it is much cheaper to produce low quality clothing & shoes in mass quantities in sweatshops. Ethical manufacturers like those featured at LAVA do not use sweatshops and do not produce massive quantities, so there is a cost associated with that. You'll pay a comparable price for a pair of Sketchers leather shoes made in a sweatshop to a pair of Vegetarian Shoes runners that are made with fair labour practices, biodegradable and/or recycled materials, and no animal skins. I think that's a pretty great deal!! There are 2 main reasons why people should switch from leather to leather alternatives. One: Every animal industry is cruel and unnecessary. I think that as more people educate themselves on the horrifying conditions of the animal industry (whether we're talking about meat, dairy, leather, fur, wool, etc.) they'll realize that animals are not ours to consume or use for our own advantage. Two: People are really starting to become aware of how our actions and our spending habits affect our planet. There is no longer any excuse for supporting companies that heavily pollute waste into our air and water. It's time that we started supporting the companies that are recycling or reusing materials, and/or using sustainable materials. The animal industry produces more greenhouse gases than transportation across the globe. Refusing to use animal products whether for fashion or consumption is therefore also an environmentally friendly choice. Trends seem to be a one-time thing. Do you think this trend of vegan/faux leather will change? I don't think that compassionate consumerism is a trend at all. I think it's a movement of people that have come to the realization that using animals for our own gains is wrong. Fashion trends will always change, but the more people that gain knowledge on the horrifying conditions of the animal industry and the environmental damage caused by producing leather, the more people will choose alternatives to leather. Is this more of a social/moral issue or a fashion problem in your mind? And why is it perceived that way? There are people who buy non-leather items without even thinking about it, simply because it is cheaper, or because the style of purse/shoes/belt they want happens to already be made with a leather alternative. There are also people who make a conscious effort to seek out stylish leather alternatives. The selection of leather alternatives at the nearest mall is not that great. Options are really limited. So the people that refuse to wear leather will go out of their way. They will shop online or travel to the nearest big city to buy a product that they believe in rather than just settle for the one or two things they can find at their closest mall. Style is pretty important to people as well. 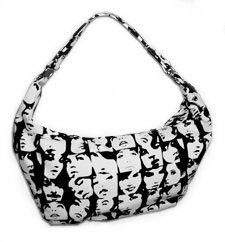 Some people would rather have a Matt & Nat bag (leather alternative) than a cheap fake leather purse from Walmart. I think there are people who simply want to support Matt & Nat because they are doing something good, but there are also people who want the "Matt & Nat" brand, and they might not even realize what the company is all about. What is surprising about the leather industry? It always surprises me how people in any animal industry can contribute to the cruel imprisonment and slaughter of innocent animals. How does someone look into a cow's eyes and then continue to harm that animal? Also, what is the process like to have animal leather for boots and bags? A dead animal's skin is used to make material that we use for fashion accessories. Obviously, if we did nothing to that skin, it would decompose and rot away. In order to preserve it, the skin is put through a process called "tanning" which uses a variety of chemicals to alter the protein structure of the skin and stop decomposition. Where, how much, how do they obtain leather, etc.? Leather is a by-product of the meat industry. Therefore cows, sheep, pigs, goats, and horses that are slaughtered for meat production unwillingly donate their skin to the leather industry. Leather also comes from many other animals that are killed specifically for their skins: kangaroos, zebras, elephants, crocodiles ... the list goes on and on. What do you think is the fascination of luxury leather goods? To be quite honest, I don't really know. I have never liked the smell, the look, or the feel of leather, and I can't really fathom why anyone thinks it is luxurious. I suppose when it comes to something like furniture or car seats, leather has always been regarded as more "posh" than fabric. It is more expensive and therefore it gives an image of wealth. Actually, I suppose that the same argument goes for animal skins used in fashion. Fur and leather are still regarded as a symbol of wealth, class and style in a lot of circles, although those symbols are diminishing the more we learn about animal welfare, the cruelty of the industry, and the extremely negative environmental impact. Why do you think it's popular? I don't know if leather is "popular" or just normal. People don't see leather as wrong because it's been used for centuries. To many people, wearing leather is just as normal as drinking cow's milk or eating pig flesh. Most people are either not aware of the tortured life of an animal used for consumption or fashion, or they don't want to know, because they would rather continue using animal products and stay ignorant to the suffering that animals experience for our new purses and shoes. What alternative faux/vegan leather goods do you recommend? Stores, designers, what is your own personal experience? There are so many great alternatives to leather. Vegetarian Shoes makes most of their shoes out of a cotton/polyurethane blend. Polyurethane is a synthetic material that is much less harmful to the environment than a lot of other synthetics. There are recycling programs in place for polyurethane, and some of the shoes Vegetarian Shoes create are actually biodegradable. Other animal and earth friendly alternatives include: organic cotton, hemp, vinyl, bamboo, recycled car tires, rubber, canvas, nylon, recycled polyester, and biodegradable synthetic polymers (such as those used to produce biodegradable plastic bags). All product photos are from Kelly's website and posted here with her permission.